How can ageing resorts along the Egyptian coast develop city-making potential? Heinrich Altenmüller came up with a strategy. The walls between the resorts are torn down. The name of the hotel chain is dismantled. The green areas become building plots. As the country’s second-biggest source of income, tourism is of huge importance to Egypt. Since the 1980s, numerous resorts have been built between the coastal road, which runs from Sudan via Suez to Israel, and the Red Sea with its coral reefs. Looking at Google Maps, you can spot a total of 722 resorts along the shores of the Red Sea, some 235 of which are still unfinished, while more are planned. Viewed from above, these ornamental developments open up to the sea, but shield themselves with barriers from the surrounding land and outside world. The city of Hurghada is where this type of tourism started. Today the city stretches for 36 km along the coast, and the Tourism Development Authority plans to extend it with a series of resorts stretching 60 km to Safaga. Graphic of the urban process. 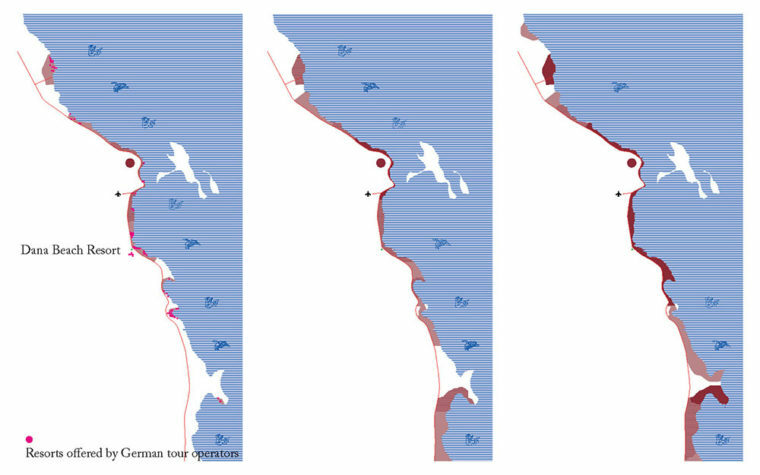 In March 2015 the lives of tourists and workers in and around the resorts and its spatial effects were studied in an on-site investigation into ageing resorts in Hurghada (for example the Seagull Resort in Sakallah, or the Dana Beach Resort in New Hurghada). Based on this analysis, the process of becoming a city is exemplarily simulated by the Dana Beach Resort, along with neighbouring resorts in New Hurghada (intact holiday worlds today). The images reveal speculation by the superposition of different systems. The ageing resorts become part of the city, and its new inhabitants (employees and their families) take over the architecture for leisure and holidaying. Starting from their boundaries, the service roads of the resorts slowly reshape into a world of everyday normality and become places of urban growth, perforating the borders and steadily reducing tourist space. Architecture and elements are used in new or other ways. For example, parasols on the beach provide shade for agriculture in former swimming pools. The transformation of the resorts results in an ironic vision of a global financial centre made up of high-rise towers with the same irregular floorplans as the former pools. Hurghada has turned into something new, which is concrete yet fantastic. The transformation of the resorts is occurring at different speeds. While the oldest has already become a city, the modern resorts (at the extremities along the built-up coast) serve perfectly as architecture for leisure. Located between these two extremes are resorts which are undergoing development. These are hybrids, where locals and tourists live side by side. The linear city is growing. Financial towers are rising from of the former pools. This project demonstrates a hypothetical view with different scenarios, but it also reveals the potential of coastal resorts to be global and local cities. Hurghada and other cities on the Red Sea attract many people from various backgrounds and are familiar to many people in Europe. The result is an Egyptian coast viewed as a global city, perfectly connected with Europe through infrastructure. 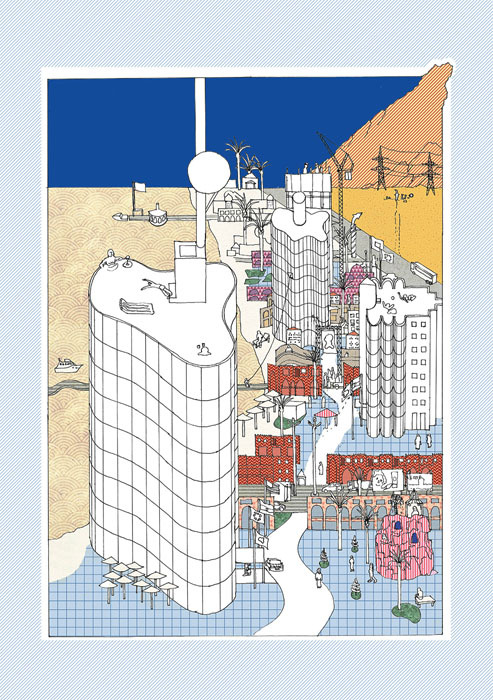 Visionary urbanism questions what is expected as reality and created by planners today. Furthermore, the narration acts as a tool to question the idea of a perfect resort and could be read as a guideline for future practitioners. 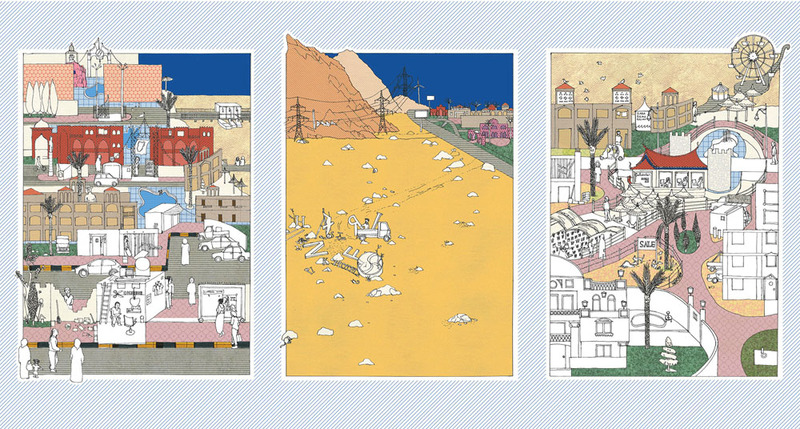 The project asks whether the future of Egyptian urbanism lies in national mega-projects put forward by political elites, or in the purposeful development of existing built environments along the coast. when did you start your graduation project? when did you finish your graduation project? I worked as a freelancer for Raumlabor in Berlin and an artist. I’m just starting to work for “org²” in Brussels.